Combine shortening, brown sugar, milk, buttermilk, and vanilla in large bowl. Beat at medium speed of electric mixer until well blended. Beat in egg. Combine flour, salt and baking soda. Mix into shortening & sugar mixture until just blended. Stir in chocolate chips and nuts. Line cookie sheet with parchment paper. For GIANT cookies, use ice cream scoop and slightly flatten the ball of dough after placing on sheet. Bake 12-14 minutes. For REGULAR cookies, use a smaller scoop or tablespoon and drop balls of dough on sheet. 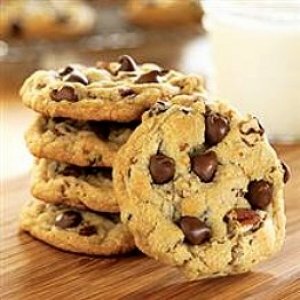 Bake 8 to 10 minutes for chewy cookies, or 11 to 13 minutes for crisp cookies. Cool 2 minutes on a cooling rack.